February 2018 – Welcome to Wyandotte Daily! Besides zoning for a new Menards store, several other items are on the Unified Government Commission agenda for 7 p.m. Thursday, March 1, including the first public hearing on the 2019 UG and Community Development budgets. The UG Commission will meet at the Commission Chambers, lobby level, City Hall, 701 N. 7th St., Kansas City, Kansas. In addition, a special UG meeting is planned at 5 p.m. March 1 in the fifth floor conference room at City Hall for a presentation on the community survey. At 6 p.m., a North Loop Linkages Study will be presented by the Mid-America Regional Council. 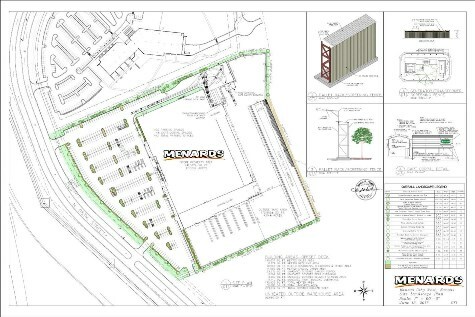 •	Menard’s is applying for a change of zone from agriculture to planned general business district for a Menard’s home improvement retail store at 1301 N. 98th St, recommended for approval. •	Zone change from agriculture and single family district to heavy industrial district for the existing power plants at 4240 and 4240R N. 55th St., and 4400 and 4800 N. 47th St., Board of Public Utilities. •	Special use permit for a party hall at 2120 Park Drive, Veronica Wesselhoft, recommended for denial. •	Special use permit renewal for an automotive repair shop at 4439 Shawnee Drive, XM Automotive, recommended for denial. •	Special use permit renewal for recycling of pavement, truck weigh scale and fill site at 626R N. 47th St., BHC Rhodes for Winifred Anderson, recommended for approval for six months. •	Special use permit for two goats at 411 Stine Ave., Blair A. Thedinger, recommended for approval for two years. •	Special use permit for a lot to be used as overflow storage and staging area for a used car lot at 1401 State Ave., Uhl Engineering, recommended for approval for two years. •	Home occupation special use permit for an AirBNB (Air bed and breakfast) at 4451 Eaton St., Corey R. Fischer, recommended for approval for two years. •	Special use permit for a short-term AirBNB at 1101, 1103, 1107 and 1109 N. 79th Terrace, Adrienne Bortz with Gabel Rentals LLC, recommended for approval for two years. •	Vacation of utility easements at 12940 and 12934 Hubbard Road, Earl Freeman, recommended for approval. •	Preliminary and final plan review for expansion of Legends Honda parking lot on Lot 2 and Lot 4 for a private car wash and detailing facility to be used by the car dealership at 2200 N. 99th St. and 10010 Lafayette Ave., Kevin Quinn, recommended for approval. •	Ordinance amendment to remove the special use permit requirement for mobile grocery markets and a new definition for “mobile market,” recommended for approval. •	Ordinance allowing the UG’s chief attorney to start legal proceedings to acquire property necessary for the 55th Street bridges 109 and 111. •	Public hearing on the 2019 proposed UG and Community Development budgets. This will be the first public hearing to receive residents’ comments on the proposed 2019 operating and capital budget and the Community Development Block Grant budget. •	Acceptance of a $107,0-00 special initiative grant from the Helath Care Foundation of Greater Kansas City for “Beat the Pack” programs. No match would be required for grant recipients, although in-kind support would be provided. •	Expansion of the regional bike share system into Kansas City, Kansas, is proposed. The Rosedale Master Plan and additional planning work includes the expansion. After a UG committee meeting Monday night, Feb. 26, a bike share program with the UG contribution at $30,000 is expected to be proposed. The University of Kansas Medical Center is expected to pay for an additional bike share program located on its campus. •	Authorizing the UG staff to apply for federal funding through MARC to construct new sidewalks, as part of the Congestion Mitigation-Air Quality Surface Transportation Block Grant Program set-aside. The UG would provide $100,000 from budgeted sidewalk funds to match a $500,000 federal grant. 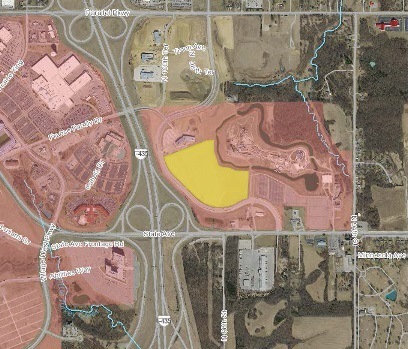 A map from the Unified Government agenda for March 1 showed the location of a proposed Menards retail store near 98th and State Avenue in Kansas City, Kansas. A new Menards home improvement store is on the drawing board for an area west of the Schlitterbahn water park. Zoning for the new store is on the Unified Government Commission meeting agenda at 7 p.m. Thursday, March 1 at City Hall, Commission Chambers, 701 N. 7th St., Kansas City, Kansas. The existing agricultural zoning would be changed to a planned general business district. The 210,754-square-foot retail store is on almost 30 acres of land, according to the UG planning documents in the agenda. The address listed, 1301 N. 98th St., is east of Village West and I-435, near 98th and State Avenue. To the north is the Dairy Farmers of America building. According to agenda information, there will be a retail store, outdoor landscape and garden area, a lumber warehouse, outdoor sidewalks connecting to 98th Street and a multi-purpose trail behind the property. About 200 new jobs are expected to be created, not including local construction jobs to build the store, according to agenda information. More information about the Menards store is in the UG March 1 agenda, online at www.wycokck.org. See update to this story at http://wyandottedaily.com/menards-store-zoning-approved/. A site plan for a new Menards retail store near 98th and State Avenue is included in agenda information for the March 1 Unified Government Commission meeting. Kansas City, Kansas, student Alana Bishop was named to the academic dean’s list at Azusa Pacific University for the fall semester. Bishop is majoring in applied exercise science. Students on the dean’s list have a grade point average of 3.5 or better. Azusa Pacific is an evangelical Christian university with more than 10,000 students located in Azusa, California, and seven regional campuses.